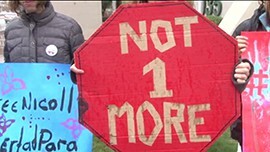 A transgender Guatemalan asylum-seeker incarcerated at an all-male facility in Florence has been a victim of sexual assault and ill treatment by guards, activists demonstrating for her release said Monday. About 20 people turned out in heavy rain at the U.S. Immigration and Customs Enforcement office downtown to call attention to the case of Nicoll Hernandez-Polanco. According to the Oakland, Calif.-based Transgender Law Center, Hernandez-Polanco has been in custody since U.S. Border Patrol agents detained her at the border in October. She has requested asylum based on physical and sexual violence she experienced in her home country and Mexico, the group said. Ochoa said that since her arrival to the ICE facility in Florence, Hernandez-Polanco has been sexually abused by fellow detainees and has faced explicit language and inappropriate touching by guards. A woman who answered the phone at the ICE office in Phoenix said the agency couldn’t comment on claims about Hernandez-Polanco’s incarceration. According to the ICE website, staff members making classification housing decisions for transgender detainees “shall consider the detainee’s gender self-identification and an assessment of the effects of placement on the detainee’s mental health and well-being.” It also says staff members should take a detainee’s self-identification into account. Victoria Villalba, another demonstrator and a transgender woman, said she was held for three and a half months when ICE detained her in San Diego. She said she was denied female hormones and discriminated against by guards. Villalba read a statement attributed to Hernandez-Polanco. “We can not give up because I have faith in both god and in the community,” it said. Both Ochoa and Villalba said they have been in contact with Hernandez-Polanco. Ochoa said Hernandez-Polanco is waiting an asylum hearing that could allow her to remain in the U.S. and work immediately. A voicemail left at the office of Hernandez-Polanco’s attorney, Heather Hamel, wasn’t immediately returned Monday. The Transgender Law Center has organized a #FreeNicoll National Week of Action and said rallies also were planned for Los Angeles, New York and Washington, D.C. 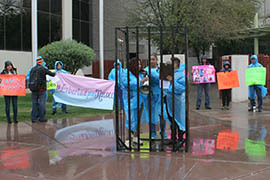 The incarceration of a transgender Guatemalan woman in an all-male Arizona prison ignited protests in Phoenix today. 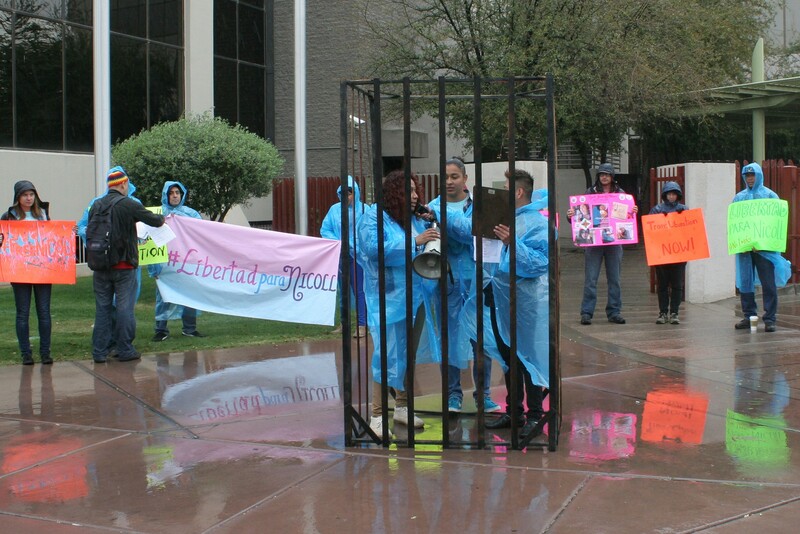 Demonstrators at the Immigration and Customs Enforcement office in Phoenix demanded the release of a transgender woman seeking asylum in the U.S. who activists say is being held at an all-male facility in Florence.